It's an Egg-straordinary display of Egg-stremely cute offerings to get you Egg-cited for the Spring Fling Egg-stravaganza !! We're putting a whole new bounce into your Spring with some amazingly cute new Paint Sets for your Meeroos. Everyone will be buzzing about the new Bumble Bee-roo for your Diurnal Meeroos. They look as sweet as can be with their darling fuzzy black and honey-gold stripes, unique eyes, and delicate veined wings to make the look complete. You could have your own adorable swarm today! Don't worry, we haven't left the Nocturnal's out of the fun, either! For them, the new Spring Paint Set is the Lucky Labyrinth Bug! These guys are striking with their spotted crimson wing coverings opening to show their inky bodies with bright white markings, and original eyes. A nocturnal version of the good-luck omen, the Ladybug, this adorable costume will look great on your Nocturnal Meeroos, out in the garden, in a crystal cave, or even just bringing some luck inside the house! To go along with these, or just to add a dash of Egg-stra panache to your Meeroo habitats, we've come up with some new Homes for you too!! To go along with the Bumble Bee-roo, a darling little Honey Bee Hive home! A truly sweet addition to any garden or Meeroo space. Want to add a little something Egg-stra to its already golden layered dome? How about the “Busy Bee” decoration add-on? This additional decoration is only 2 prims and comes FREE in with the home! This way your Honey Bee Hive home can bustle with little fluttering friends! We also have for you the Spring Leaf home. This precious little cupped leaf is the perfect place for your Lucky Labyrinth Bug Roos to play around, or any other Meeroo for that matter. Bring a little touch of the outside in, or add a vibrant little touch of green to your outdoor habitats with this cute leaf spring. Who knows what treasures your Meeroos might find and leave in the little cupped surface for you! Want more? Ok, ok .. one more! In honor of this Egg-specially amazing season, we're bringing you the Egg Basket home! This white wicker basket's rim is striped in bright colors, and holds a set of colored eggs in rich red, green, purple & blue! A great accent for spring that can be placed inside or out. And don't worry about the eggs, they're ceramic.. so we're pretty sure your Meeroos won't try to eat them. Well, mostly sure. Oh, and you know that's not enough for this Egg-citing event, right!? We'll also be bringing back the Egg-stravaganza Gifters! The nature-inspired 'gumball machine' styled vendor is waiting for you! The big transparent gourd globe top has been stuffed with Spring Egg surprises once again, and this year we have TWO of them for you! Last year's classic colors (Pink, Blue, & Green) are there for you in one vendor. This way if your'e new to Meeroos, or you missed a piece you REALLY wanted last year, you can try to get all the classic colored pieces now! Oh, and as an treat, the Spring Roo Statue from last year is in there as well ..
And we've added a second machine with all New Colors for this Spring! So now you can try to get your: Long bunny-esque 'Flutter' ears, your little 'Very Short' cottontails, pastel Roo-slippers, bunny-nose mask piece, or even the slightly harder to find knit Meeroo Plushies from the Egg-stravaganza Gifter in the new colors of Spring – Purple, Yellow, and Pastel Rainbow! The vendors will also have a Super Rare statue that's unique for this year, too! The 2013 Spring Statue .. well.. we'll let you find the adorable little guy and find out how CUTE he is yourselves! This statue will only be available through the Egg-stravaganza Gifters!, and is a Rare drop, so good luck!! 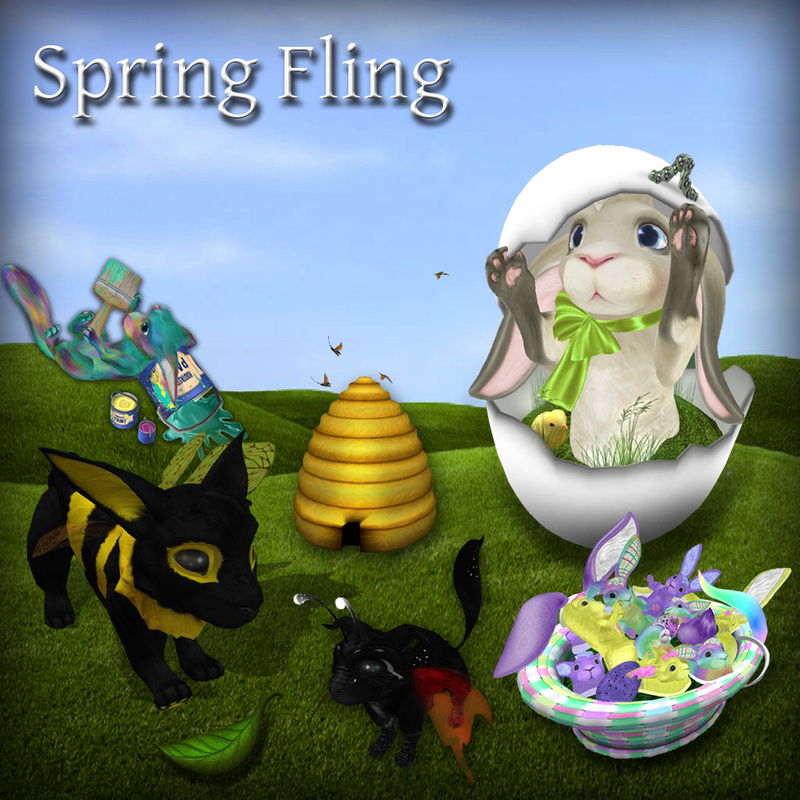 All this is waiting for you .. so hop, Hop, HOP your way to Roo Sim now to get your Spring Fling items!